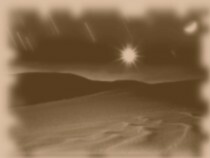 Paddy and Jack had been separated from their unit for 3 days now, wandering in the desert and hoping to avoid German patrols. They were out of food and seriously low on water. Jack looked where he was pointing and there was a tree in the middle of the desert. They walked a little closer. They noticed that this wasn’t any tree, it was a tree covered in bacon. Crispy, fried strips of bacon. Huge chunks of peameal. The smell was irresistible for the two starving men. “Is it a mirage?” asked Jack. The two brothers looked at each other for a few seconds. Then they turned and ran towards the tree. Paddy pulled out ahead of Jack and was closing in on the tree when a burst of machine gun fire rang out, splashing the sand at his feet.